Debt consolidation is where someone obtains a new loan to pay out a number of smaller loans, debts, or bills that they are currently making payments on. In doing this they effectively bring all these debts together into one combined loan with one monthly payment. Since this is bringing multiple debts together and combining them into one loan, this is referred to as “consolidating” them. That’s why it’s called a debt consolidation loan. In reality, it’s actually technically impossible to combine loans and merge them together. Each loan has its own interest rate and repayment terms. Each one is essentially a contract where you borrow money and then agree to pay it back over a period of time with set payments. So to combine or consolidate debts, you actually need to get a new, larger loan and then use the money from it to pay off all the smaller loans you wish to consolidate (bring together). People use debt consolidation loans to consolidate smaller loans, credit card balances, overdraft balances, bills, and even payday loans. - What is Debt Consolidation & How Does It Work? - Is a Debt Consolidation Loan Good? Debt consolidation loans are issued by banks, credit unions, and finance companies. There are also some debt repayment programs for people who are having trouble paying their debts that effectively consolidate all debt payments into one payment. So some people also see this as a form of debt consolidation. It simplifies their finances. Instead of having many debt payments to keep track of and pay on time every month, they now have only one. It can save them money by reducing their interest rate. It does this by paying off high interest debt with a lower interest rate debt consolidation loan (provided you can get approved for a low interest rate consolidation loan). It can make life easier with a smaller monthly payment. This can be true if you consolidate at a lower interest rate or have a longer period of time (amortization period) to repay the loan. It can pay off debt faster. However, this only works if you obtain a lower interest rate and keep your current monthly debt payment pretty much the same as it is now. This then allows more of your monthly payment to actually pay down your debt (the principal) since less of the money is being eaten up by interest. When you receive a traditional debt consolidation loan, the company lending you the money either uses the funds to pay out the debts you jointly agree will be paid off, or they deposits the funds it in your bank account and it is then your responsibility to pay out the debts or bills you wish to consolidate with the loan proceeds. Interest rates for debt consolidation loans are primarily determined by two factors: your credit score and the collateral you can offer for the loan. Your credit score represents the statistical likelihood that you’ll be able to repay a debt as set out in your initial signed agreement with a lender (if you eventually fully repay a debt, but you were late on a bunch of payments, then you technically didn’t repay it as agreed and this will impact your credit score). The better your score, the more confident a lender can be that you’ll repay a new debt without any problems. Collateral for a loan is an asset you can pledge as a guarantee or loan security in case you are unable to repay the loan. The only collateral banks or credit unions are interested in is something that can quickly and easily be converted into cash. Most often this is real estate or a newer vehicle (they’re not interested in big screen TVs, household appliances, tools, equipment, or collector items). If you have a high credit score, you may be able to qualify for an unsecured loan (no collateral required) from a bank or credit union and you’ll probably get a decent interest rate. However, if your credit score is too low, you will not be able to qualify for a low interest rate loan – even if you can offer good collateral. Typically, the better collateral you can offer for a loan (banks call this security), the better interest rate you will get. If you use your home as security, you’ll likely qualify for the very best interest rate. If you can offer a newer vehicle as security, then you may also qualify, but the interest rate won’t be as low as if you offered real estate. Banks and credit unions are able to offer low interest rate loans. If you apply for a loan anywhere else, you’re likely looking at a much higher rate because these lenders are technically dealing with higher risk. Some finance companies may take an older vehicle or household appliances as security for a debt consolidation loan, but the rates are often very high. If you look online, you’ll typically see published interest rates around 47%. More and more people are asking a very important question. Is a debt consolidation loan a good idea? Are they good for your finances? The answer depends on your situation, but to properly answer this question, we should first let you know about the hidden downside of consolidation loans that many people don’t see until it’s too late. Popular personal finance talk show host Dave Ramsey once shared the results of an American bank's study into their clients who received debt consolidation loans. The bank found that 78% of people who received a debt consolidation loan where not financially better off once they had repaid their loan. Instead, these people had re-accumulated the debt. The lesson here is that a consolidation loan has to be used properly if it's going to benefit you. To use any form of debt consolidation as a stepping stone to improve your finances, you must follow a spending plan to keep your spending under control so that you don't re-grow the debt you're currently paying off. The downside to debt consolidation is that it can fool you and promote unhealthy financial habits. When people consolidate their debts, they often feel really good about themselves and their finances. They’re pleased that they’ve taken action on their debt. They know they’ve made a smart move by reducing the interest they’re paying, and their finances are so much easier to manage with one monthly payment. Many times this monthly payment is lower than their previous payments, so now they’ve got extra breathing room in their finances and a little more money to spend. Life now seems so much easier. The problem is that a lot of people get debt consolidation loans because they have been spending more than they earn. Instead of realizing they’ve been overspending and create a plan to get back on track, they make their financial situation worse by continuing to spend more than they make. In the long run, the consolidation loan only puts them in a worse financial position because they run up new credit card and/or line of credit balances that they have to pay every month in addition to their loan payment. All this debt can also impact their credit and their ability to qualify for another debt consolidation loan. Don’t let this happen to you. Create a budget today and make sure you are spending less money each month than you earn. As your life gets busier, following a budget will keep you on track and prevent you from slowly slipping into debt as your expenses increase. 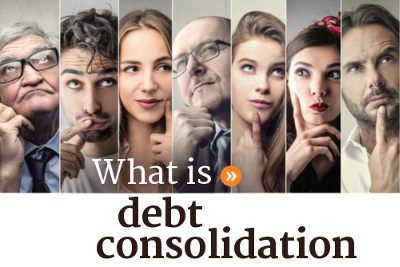 Different Ways to Consolidate Debt - The Big Picture Answer to the Question "What is Debt Consolidation"
If anyone tries to sell you a debt consolidation loan or service that costs thousands of dollars in up-front fees, walk away. It's not worth it - no matter how good it sounds. People pushing products like this are just trying to make money off you. If you don't feel you have any other options, contact a non-profit credit counselling agency near you. They're Credit Counsellors are experts at finding something that will work and truly move you forward. Home Equity Loan – this is often called taking out a second mortgage. If you have a good amount of equity in your home (the amount you own after you subtract your mortgage from the value of the home), this could be an option. This option offers the lowest interest rates when done through a normal bank or credit union. Line of Credit – if your bank or credit union can approve you for a line of credit, you could use this to consolidate debt. Lines of credit can be secured by your home or your bank may offer you an unsecured one if you have good credit and a good income. The downside of consolidating this way is that you have to discipline yourself to pay a set amount each month that is much higher than your minimum monthly payment. If you only pay the minimum, it will take decades to pay off. Debt Consolidation Loan Through a Bank or Credit Union – if you have a decent credit score and have some good collateral (security for the loan) to offer, this could be an option. This option typically offers the next best interest rates after mortgages and lines of credit. Debt Consolidation Loan Through a Finance Company – their lending criteria isn’t as strict as the banks’. However, their interest rates can be up to 47%. Just so you know, an interest rate of 30% or more will double the size of your loan if you take 5 years to pay it off. Credit Card Balance Transfer – credit cards often offer low interest rate balance transfers as a means of debt consolidation. While this can be very attractive, it can end up being a bit of a trap. If you don’t pay off your balance by the end of the low interest promotional period, you usually end up paying normal credit card interest rates of around 20%. This will double your debt if you take 7 years to pay it off. Low Interest Rate Credit Cards – if a bank or credit union doesn’t want to lend you money and you have a good credit score, you could end up consolidating using a low interest rate credit card. The down side of doing this is that you really have to discipline yourself to pay a set amount every month that is a lot more than the minimum payment to ensure you get the balance paid off in a reasonable length of time. Debt Repayment Program – when someone doesn’t qualify for a debt consolidation loan and is struggling to make their minimum payments, a debt repayment program such as a Debt Management Program or a Consumer Proposal may be an option. These repayment plans eliminate interest, consolidate debt payments into one affordable monthly payment, and ensure you are debt free within 5 years. There are other pros and cons to programs like these and are only appropriate for certain financial situations. To learn more about them or see if one of them would be appropriate for your situation, speak with a non-profit Credit Counsellor. Hopefully you now understand the answer to the question, "What is a debt consolidation loan and how does it work?" Whether or not a debt consolidation loan is right for you ultimately depends on a number of things including your financial goals, your credit score, and whether you follow a budget. Don’t fall into the trap of using a consolidation loan as a crutch to make life easier for the moment or to just get you by for a while. Instead, create a budget, make sure your spending is less than your income, and create a plan to get yourself to where you want to be 5 or 10 years down the road. This should just be a simple plan that lays out how you are going to get out of debt and then how you are going to save for your future goals like owning a home, taking vacations, investing, or retiring. If you need some help putting together your plan or exploring your options, feel free to speak with a non-profit Credit Counsellor near you. They are experts at this sort of thing, and appointments with them are usually free and confidential. You can often even do all this over the phone with them if that works better for you. Once you have your budget and financial plan in place, you can then figure out if a debt consolidation loan will help you accomplish your goals, and if it will, you’ll be able to stay the course and make the loan work for you.